Finishing projects makes me so happy these days! In addition to my larger quilt this week, I finished up my smaller, but still pretty work intensive New York Beauty mini quilt project. I suppose overall that the majority of the work was done in the paper piecing itself, but I decided a project like this deserved to be hand quilted as well. 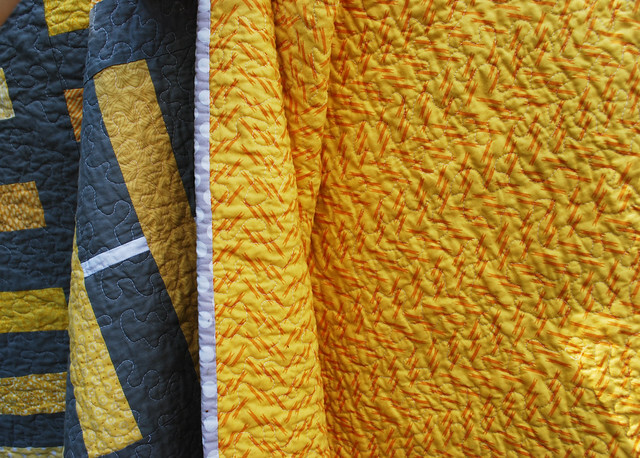 I really do love to hand quilt. It’s such a relaxing hobby, more so than anything else that I’ve found for myself. 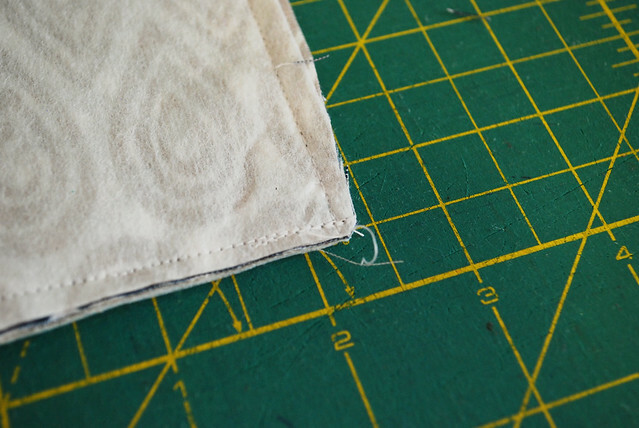 The closest thing that I’ve come to enjoying hand quilting is sewing binding by hand, but even that’s not quite as nice. 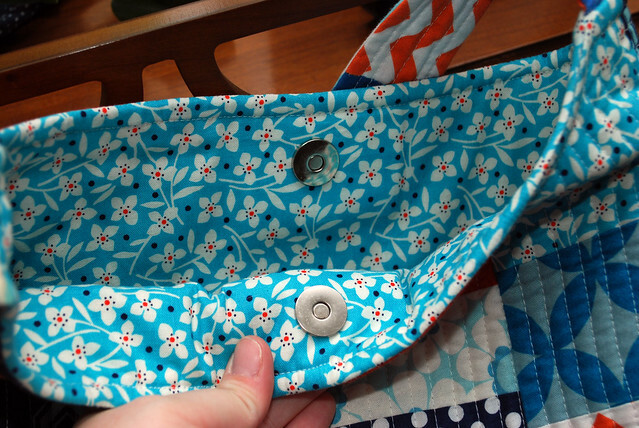 That being said, this little quilt was TOUGH to hand quilt neatly. There were so many layers of fabric pieced together that is was hard to get my needle through neatly and and without A.) puncturing my finger every time I made a stitch and B.) 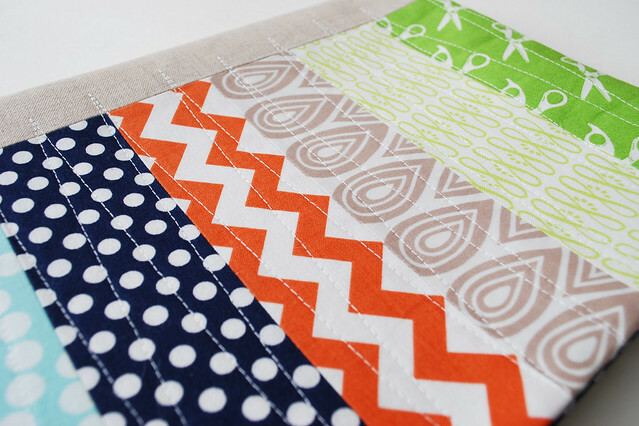 really more importantly, getting the stitches even on the top and back of the quilt. I noticed after I was finished that there were a few places that I don’t think the needle actually punctured the backing in spots. I tried not to worry about it too much since it was just a project for me. I know it’s not something that can happen a lot, but it’s really exciting to be able to finish two projects in one week! I have a few other things that I’d like to get started soon, but shows are going to start taking priority for the next few weeks for now. I’ll do my best to share how those projects go though! It’s been TOO LONG since I’ve finished a real quilt. I’m so happy to have finally finished this one! 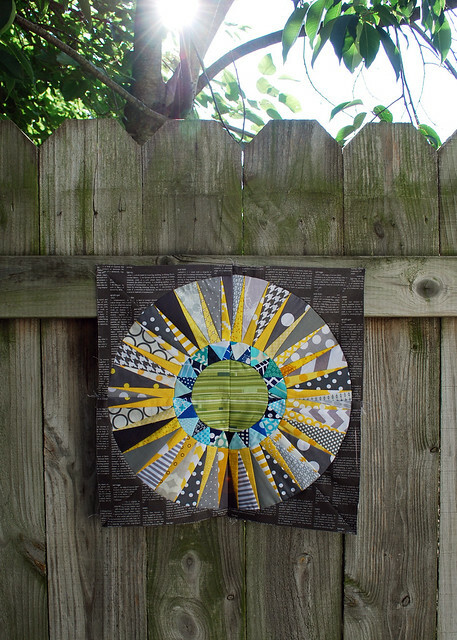 I bought this quilt kit from the crazy talented Modern Quilt Studio duo of Weeks Ringle and Bill Kerr last August at the American Quilter’s Society show in Grand Rapids. I was so busy through the fall and the holidays last year with my shows that I didn’t begin working on it until January. 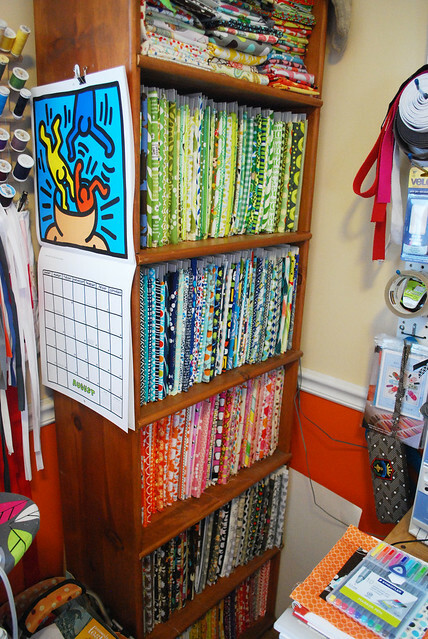 I spent a few days cutting everything out and beginning the piecing, but then I lost my stamina and hung it over the door of my sewing room where it stayed until the beginning of this week. 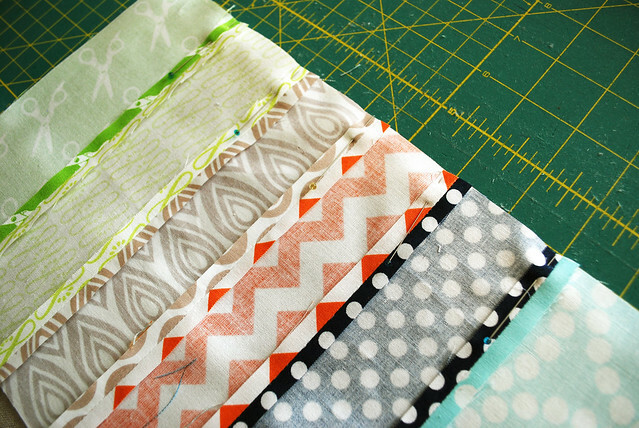 In the past month though, I’ve really been excited to make quilts again. I have a big project that I’ve recently begun cutting out, but with shows starting again soon, I’m not sure how long I’ll have to really give that my full attention. I have a few other projects that are started as well, but I knew I’d be able to finish this one up and finally have a project that I could wrap up in a few days. The remainder of the piecing was very quick. The technique for making the improvised strips was super easy and took little planning on my part. I was able to finish off the remainder of the top in one day, and I was quite happy with that speed. 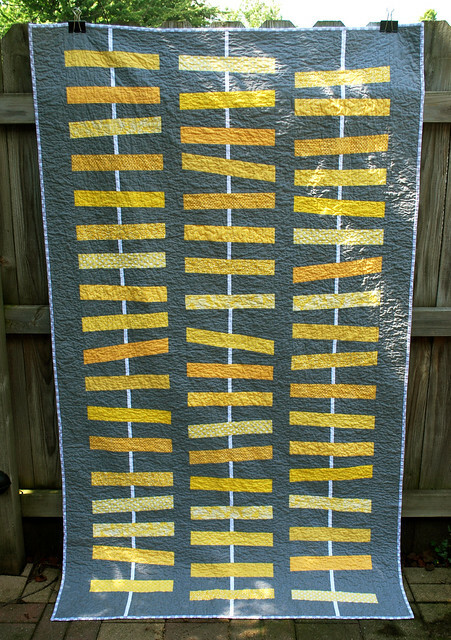 I had initially planned on using a solid yellow backing, but both of the yellow Kona cottons at the store had less than I needed on the bolt. I took a chance that I would be able to find something at JoAnn’s and in the end I was so happy my first choice didn’t work out. 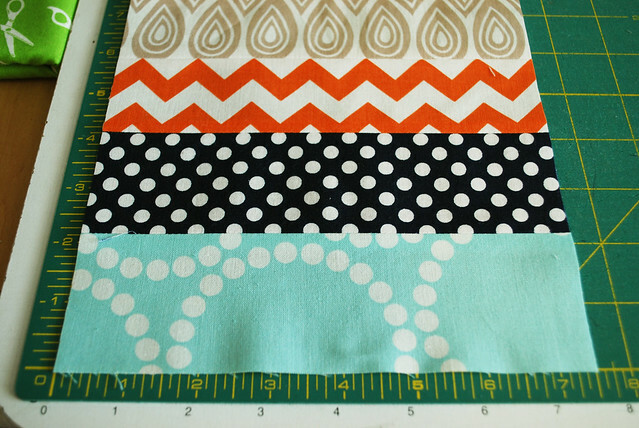 I used a Denyse Schmidt print (which is pretty much the only fabric I buy from JoAnn’s now) and it worked perfectly. I love the all over brightness with the subtle design so much. Quilting is always my toughest challenge, but this time I stuck with a tried and true stippling pattern, and I did okay with it all. Not perfect, but I’m getting better. One of these days I’ll branch out, but I wasn’t in the mood to pick out stitches when new attempts didn’t work out with this one. The kit also came with enough of the same gray fabric from the front of the quilt to make the binding, but I decided that I wanted something with contrast. I chose a much lighter gray and white, Michael Miller polka dot print. I think it really finishes the whole quilt off nicely. 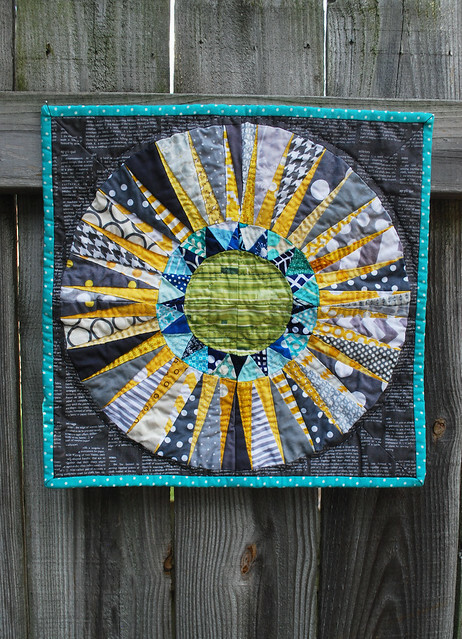 The design of the whole quilt, despite the dark gray, feels very bright and fun. I’m so happy with it! 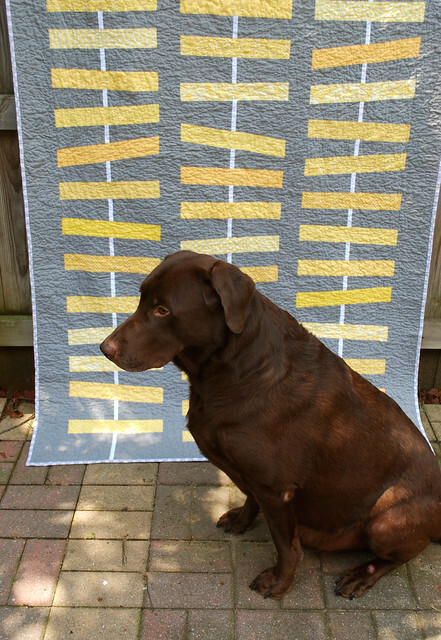 And of course, here’s the necessary quilt and dog shot. Hudson wasn’t in the mood to look at me, since I had just woken him up from his job (nap) to take photos. 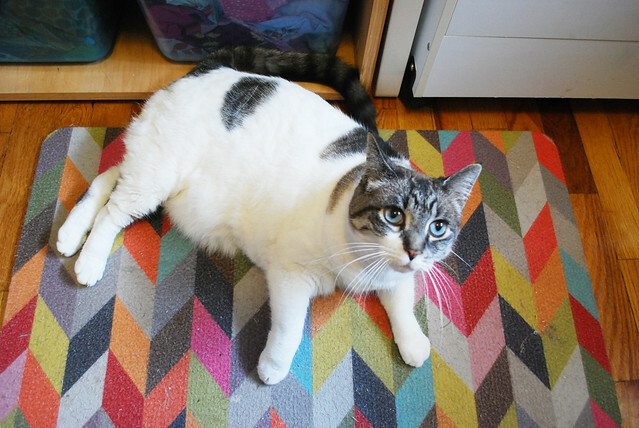 I think though, since he was previously sleeping on the quilt, that he approves of my work. I get so easily distracted. 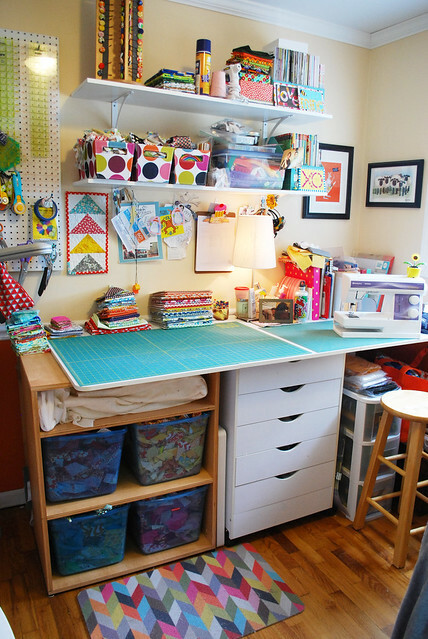 Quilt and sewing books, Pinterest, and other people’s blogs should be banned when I have projects that are already started that need to be finished. 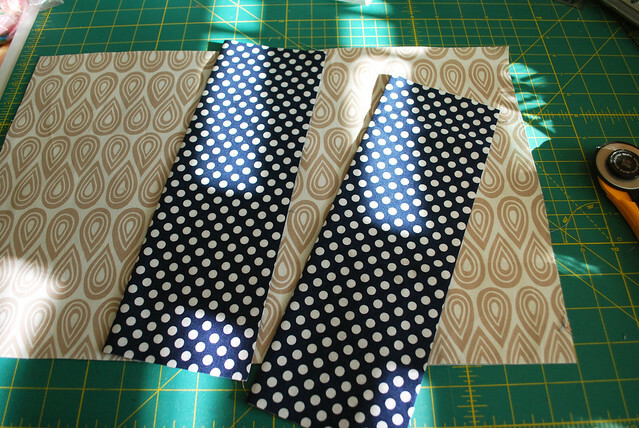 Thankfully, nothing specific was on the books as a “must-finish” project this week, and I went where my distracted little brain wanted to take me yesterday and today…to paper piecing! 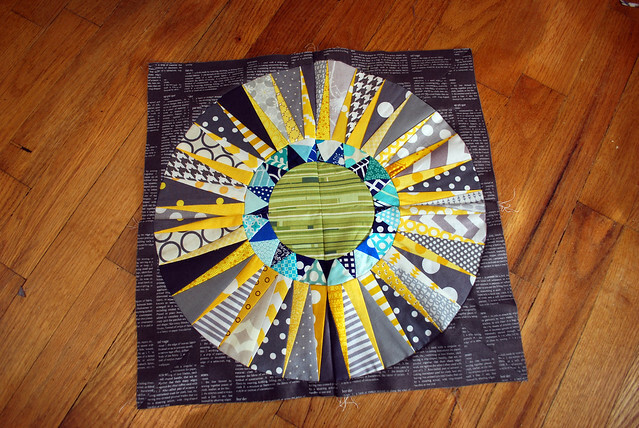 Earlier this summer I bookmarked this tutorial for paper piecing a New York Beauty block by In Color Order. I printed off four of the templates found here, hoping that I might find some time this summer to give them a try. 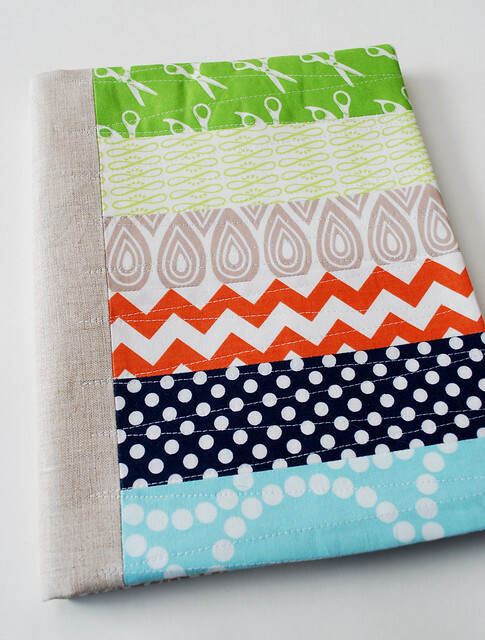 This, like most quilting projects in the past year or so piqued my interest, but fell to the wayside while I worked on getting ready for craft fairs and keeping up with my business sewing. So, I guess here’s where I get a little distracted. 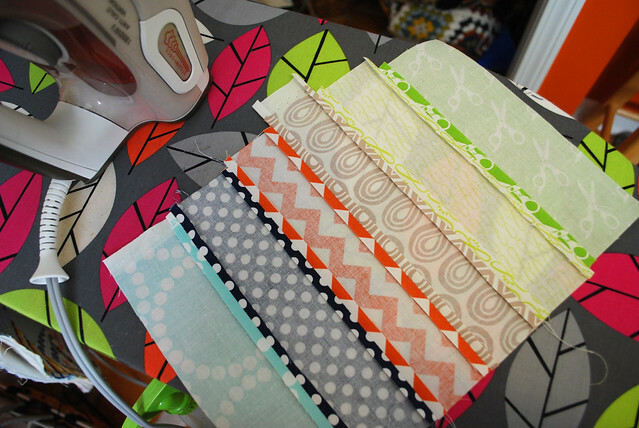 A few weeks ago, a friend and I decided to check out the Ann Arbor Modern Quilt Guild. 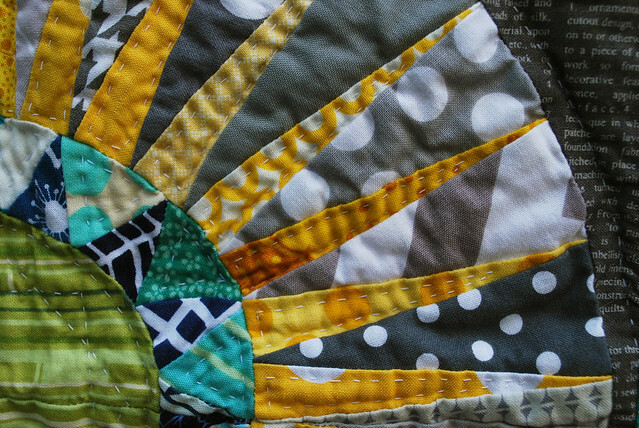 I was a member of another modern quilt guild several years ago, but that one folded, and since then, I’ve been guild-less and feeling less and less interested in quilting. 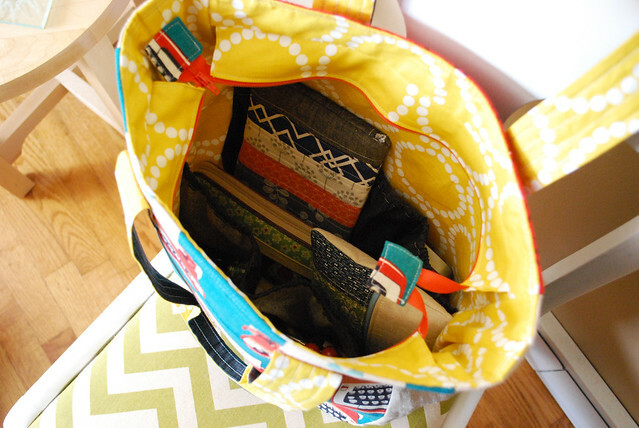 I know I incorporate quilting into my bags and pouches and things that I sell, but I haven’t made a real quilt since, oh, maybe last winter. Like winter 2012. 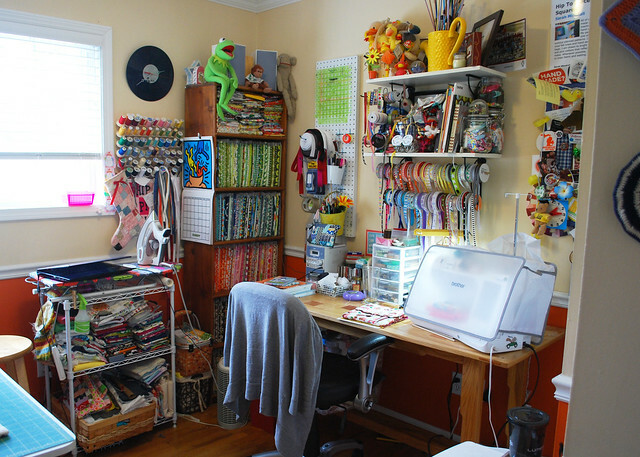 But that meeting invigorated me, and I left wanted to do some real piecing and real quilting again. So over the past few weeks and days, I’ve been playing around with fabric again, working on some stalled projects. 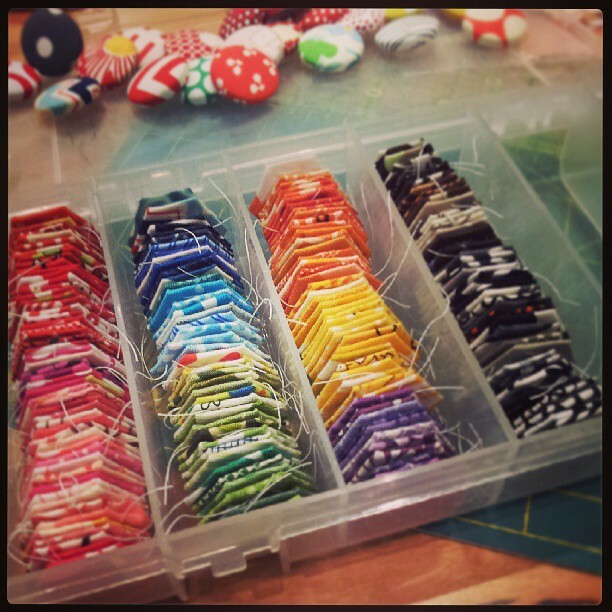 So now that I’ve figured out how wonderful paper piecing is, I think I’m going to let those other projects continue to hang out a while longer. The process challenges my brain to think, and I’m in awe of what I made in the past day and a half. Tonight, after I finished piecing it and took it out to photograph, I sandwiched it up and debated how I wanted to quilt it. 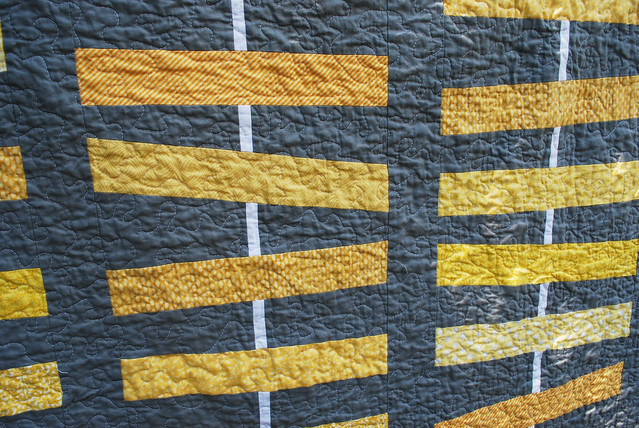 I know I could finish it faster on my machine, but I really feel like this quilt is bringing back my love to quilting, and I’d like to spend a little more time with it while I hand quilt it. I think it’s alright to be distracted by what you love. 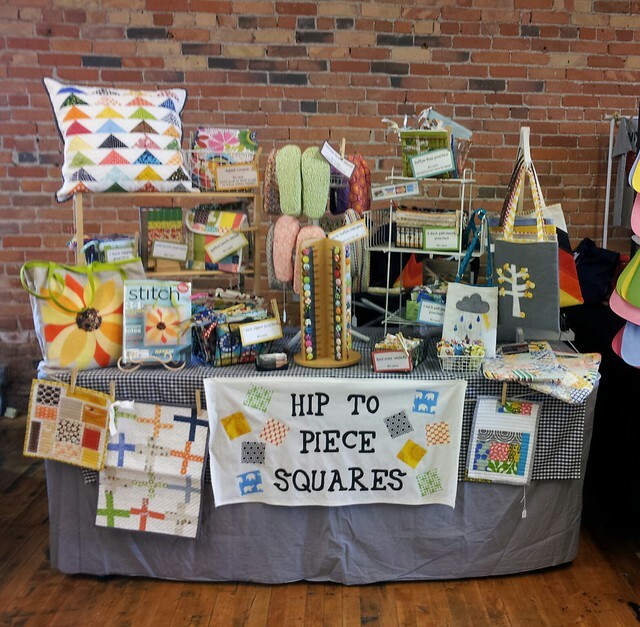 For the past two weekends I’ve been set up at semi-local craft fairs. For a number of years, I pretty much exclusively did summer shows like these with my friend Amie of enamor. We’ll still do shows together when we can, but every now and then, it’s nice to do shows where I can spread out and have the whole tent to myself. Sometimes I miss having someone to talk to all day when it gets slow (or weird…and no, I don’t sell potato sacks thankyouverymuch) but I’m really excited with how my individual set up is taking shape. Earlier this spring I had an idea to find a used ladder to incorporate into my setup, but after talking to Ben about what I wanted to look for, he suggested that he just build me one that fit the dimensions I was looking for. Not only does it fit perfectly, he built it so it will lay flat with the shelves inside it for transporting it. I can use all the help I can in that department since I have a very small car that’s not the best for always fitting everything that I need inside. Finally, I had picked up this super inexpensive Ikea chalkboard last year (I had figured I’d make one of those too, but found this one for less than $15 and couldn’t pass it up), but I was never happy with how I was making it look. This summer I invested in some chalk pens that really made a difference in how I could make it look. I loved how easy they were to use and when I needed to do so, the wiped off without any problem. 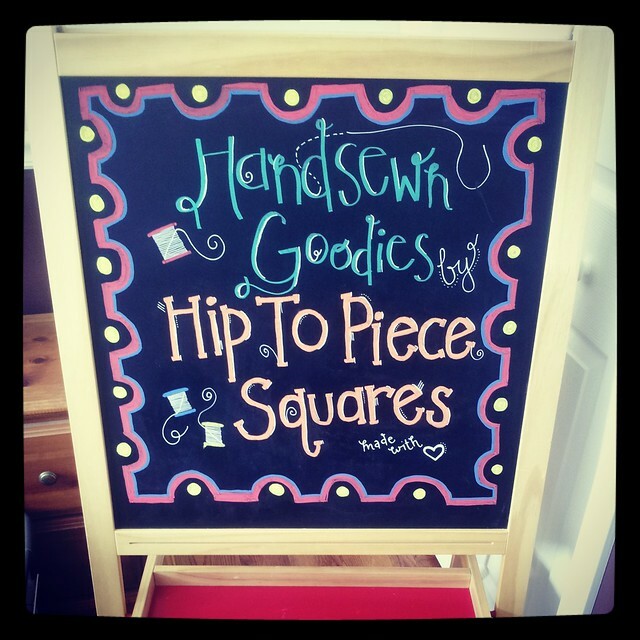 For instance, when I first wrote out the sign and spelled my name “Hip To Piece Sqares.” No one’s going to notice that or anything. And aside for weathering my first show all zipped up inside my tent during a severe thunderstorm warning in the second weekend (all was okay, but good grief, the rain!) 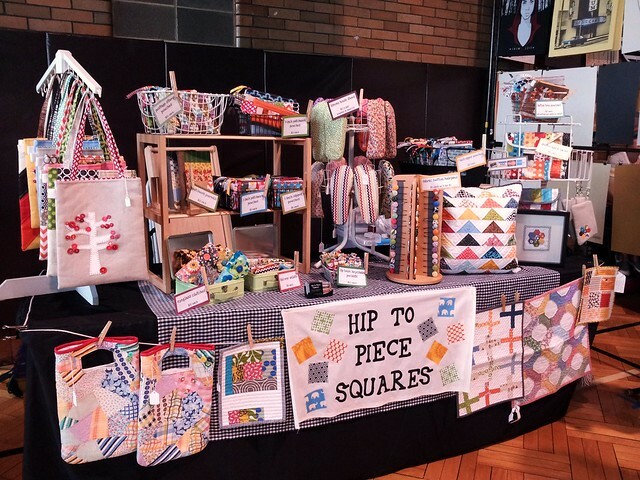 I had a fantastic two weekends of craft show fun. quilt it. quilt it good. 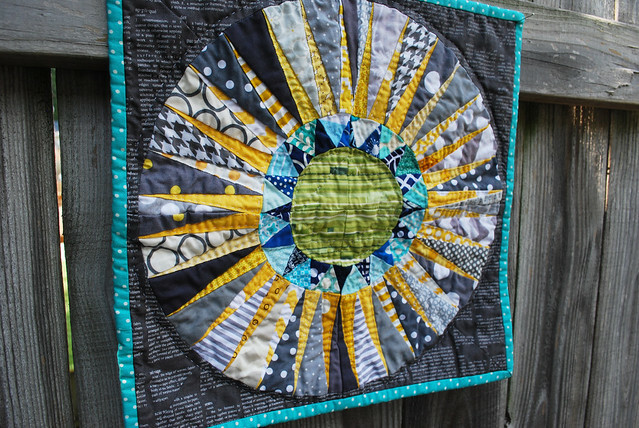 ….If a problem comes along, you must quilt it. 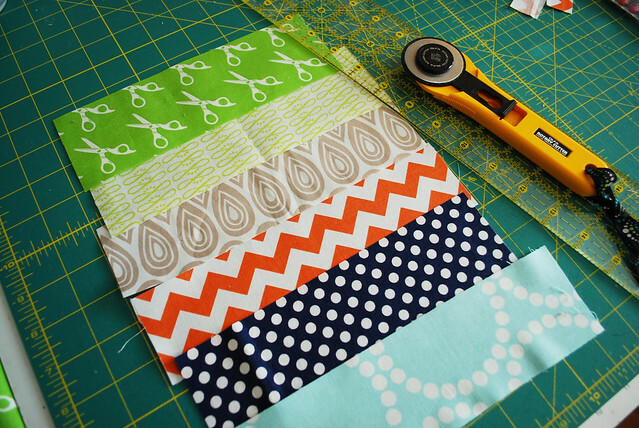 If the fabric sits too long, you must quilt it. Now quilt it! 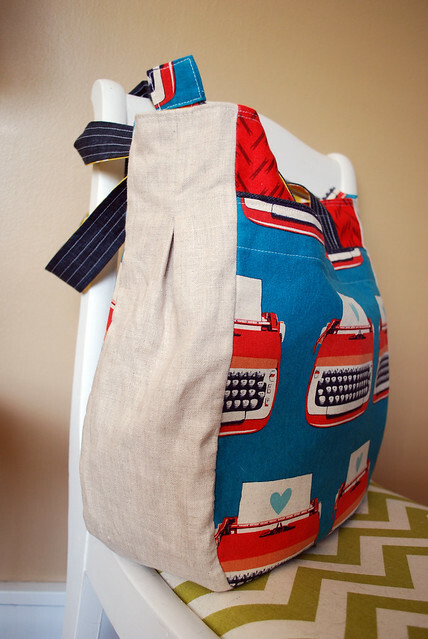 Anyway, a few weeks ago, I had a friend e-mail me asking me if I could make her a bag to give to someone as a thank you gift. She didn’t really have a whole lot in mind, other than that her friend liked the color purple and dogs. 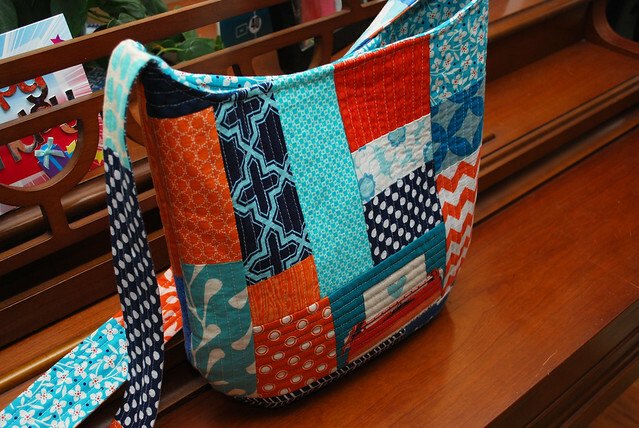 I decided that since she was giving me free range with the project that I’d attempt something new, and make myself the same bag as practice (in colors that I like since I’m not much of a purple fan). 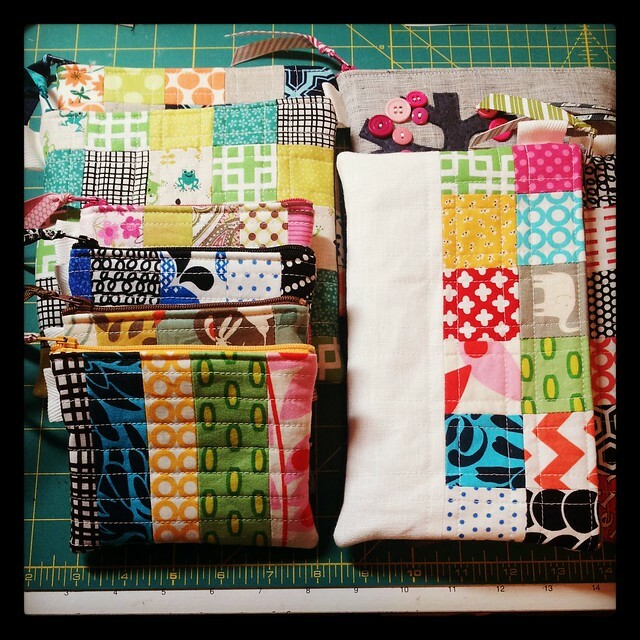 I had played around last summer with the quilt as you go method on some pouches that I made, and I really loved the process. 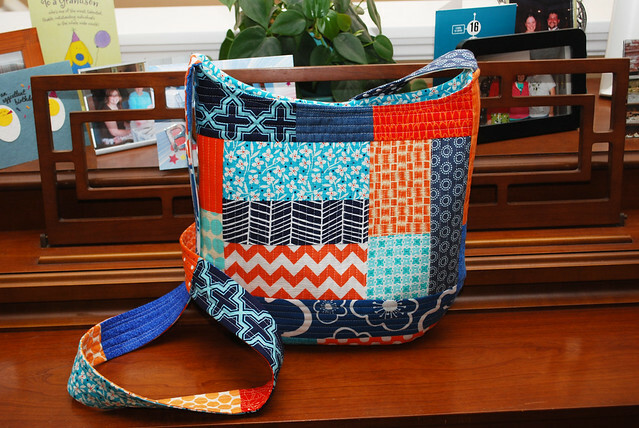 This time, to make the body of the bag, I used canvas layered with batting to quilt onto. The canvas’ weight along with all of the close line quilting gives it a fantastic, durable feel that I’m pretty much in love with. I want everything I make to feel this good! 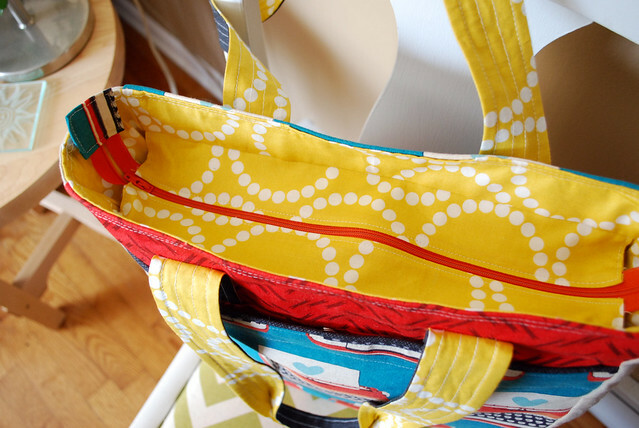 When I sketched out the outline for the bag, there were a few design details that I didn’t think about the whole way through, such as the point where the bag’s body meets the strap. I cut the bag so the actual bag itself would slope, but after I made it, I wasn’t sure if I loved how it came together. Next time, I might scrap that plan to make the strap do all the sloping instead of the body. I’m not sure though. It was do-able to complete it as it was, but I just feel like it could do with some tweaking. This, however, was not a design flaw. This was a, “It’s midnight, and I want to get this stupid thing finished so that I can use it tomorrow” flaw. It only sort of repels itself open. I’ll get around to fixing it at some point. For now, it’s usable, and I plan to use the heck out of it! Or, maybe I should title this post, why I’ve lost my mind. 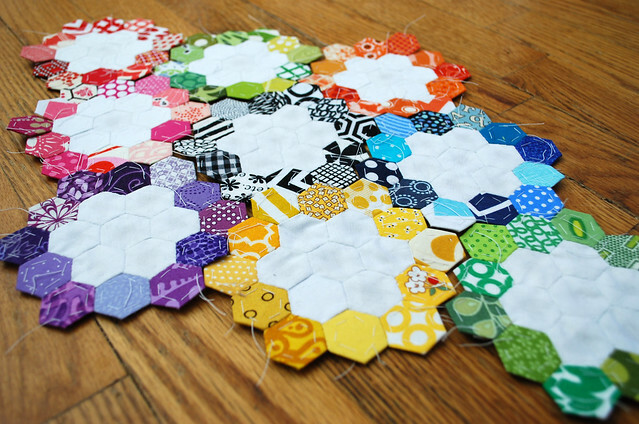 About a week ago, I started making paper pieced hexagons. 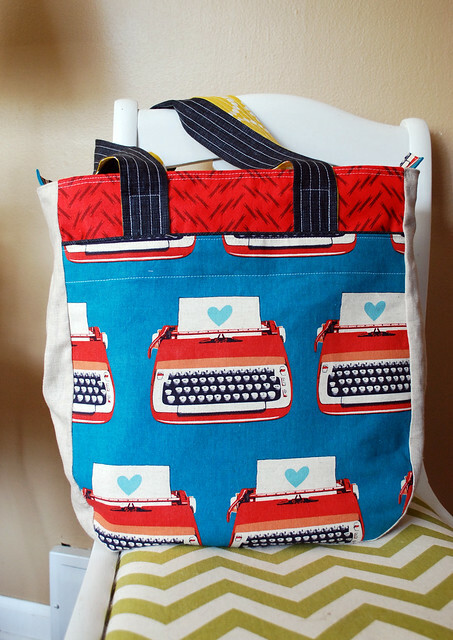 It’s not really anything new; I’ve been sewing them onto bags that I make for several years now, but something must have broken in my brain because I couldn’t stop. So here’s my progress after about a week. 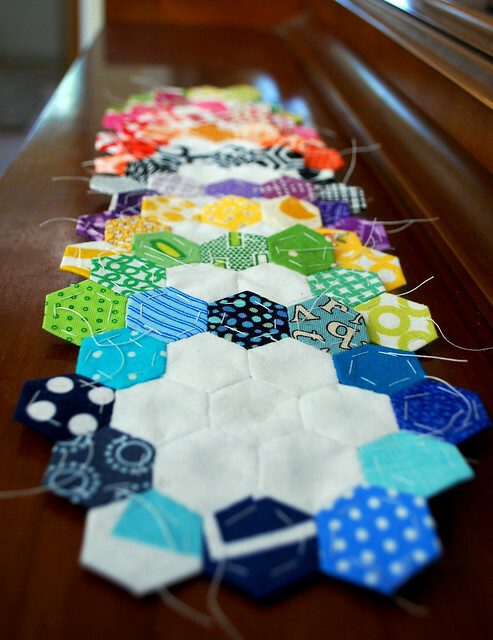 It turns out that it takes a LOT of little hexagons to make a quilt. Even if I made it just big enough for my feet. I’m a pretty quick handsewer, and I’m pretty neat too, but I’m surprising myself at how slow going they are. 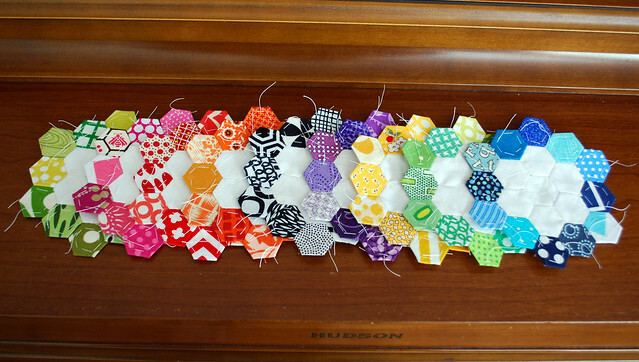 I figured I could whip out a few blocks out each evening, but to paper piece the hexies, then to sew the three rounds per block have taken more time than I thought it would. I just haven’t thought any of this out. The one thing that is helping me though, are the pre-cut hexagon papers that I purchased. 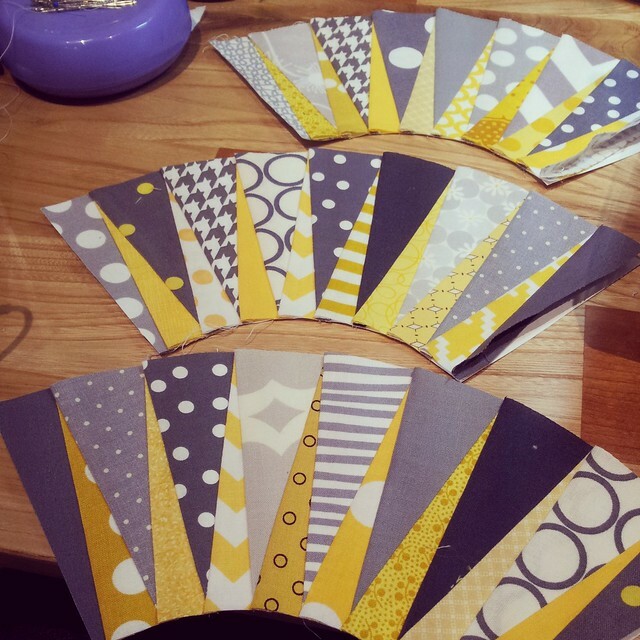 I picked up a small package of them from Paper Pieces at an American Quilter’s Society Quilt Show last summer, but I blew through them quickly. I ordered a bulk pack of 1500 1/2″ pre-cuts and they’re so nice. 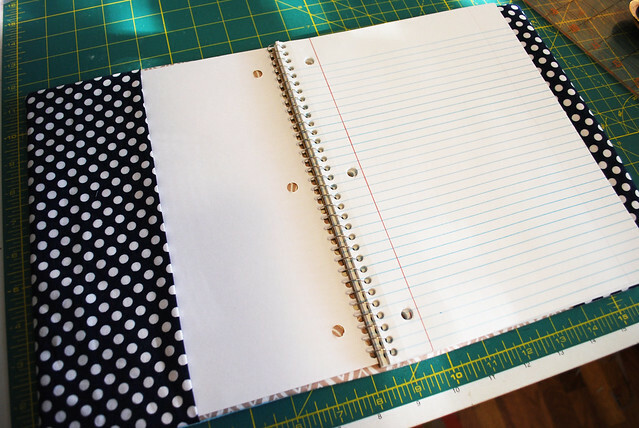 Before, I always just made a template and then traced and cut out the hexagons myself. These are beyond awesome. Nevermind. Push the finish date back until I’m 80 instead. I do a lot of craft and art shows each year. So far this spring, I’ve had three shows in three states:Michigan (my home state), Ohio and Indiana. Some shows are really, really good, and some shows are, well…not so good. 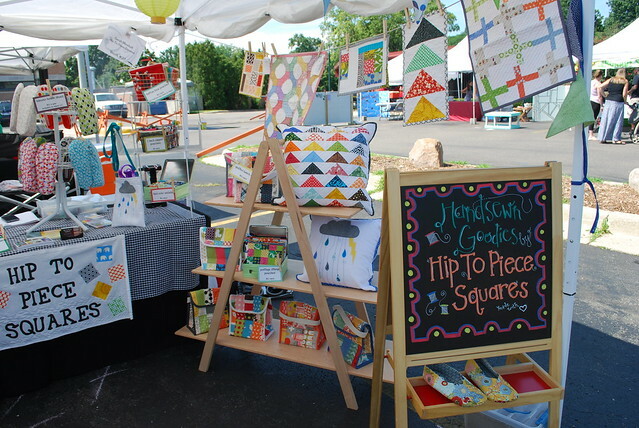 Last week I drove over 4 hours to Indianapolis, Indiana for a show called INDIEana Handicraft Exchange. I felt really good about it, and worked myself silly to get ready for it. And so, it just turned out to not be such a good show. I base my success on so much more than just the money that I make. Sure, I love having a show that helps me pay bills and buy more supplies to be able to keep sewing, but it’s also about meeting people, passing out my business cards, getting feedback (more than just the negative feedback, too) and whether or not I had a good time. It seems like a loose way of determining if the show was good or not, but all of these things really do matter. I like to think that I put a lot of work and effort into all of what I do. I try very hard to make quality pieces that have great craftsmanship and aren’t shoddy. I may not be a great artist, but I do my best to make unique, exciting pieces that you won’t see at the other tables. But most importantly, I try really hard to make only the things that I like. 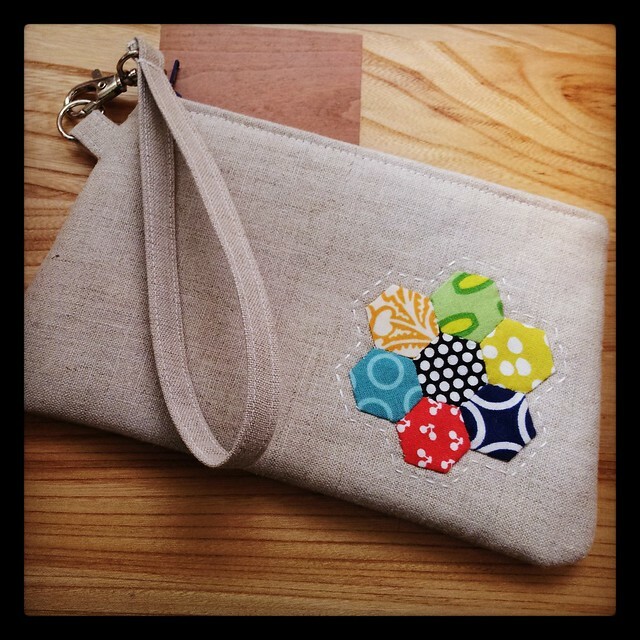 I am very appreciative to have found an audience among the people that I’ve met and sold my silly bags and pouches to, but if I’m not happy with what I’m making, then I’m just not going to make it. Plain and simple. It’s not worth my time. But it’s the people who give unsolicited “criticism” about what’s on my table that really gets to me. Back around the holidays, I had someone ask if “I had anything that wasn’t so childish.” Nope lady, I’m a kid at heart and it shows. I like silly patterns with frogs and robots and squirrels. In Indianapolis, I had uninvited feedback from another woman who told me that “you’d make a lot more sales if you used more solids.” She told me that my workmanship was “nice, but a lot of people don’t like these patterns mixed together.” She then went to to pick up pieces that seemed to work for her, and compare them to the pieces that she didn’t like. Her criticism went on for a solid five minutes. I didn’t know what to say back to her. It was like a cartoon moment where my jaw was hanging open, and I couldn’t find the words to tell her how I really didn’t care what she thought! I make what I LIKE, and furthermore, no one has the right to tell me that my sales could be better! I’m doing just fine, thankyouverymuch. I just wish I could have told her that. But on the flip-side of this, I really do love doing shows. I have made so many friends and met wonderful people who appreciate what and how I make what I do. 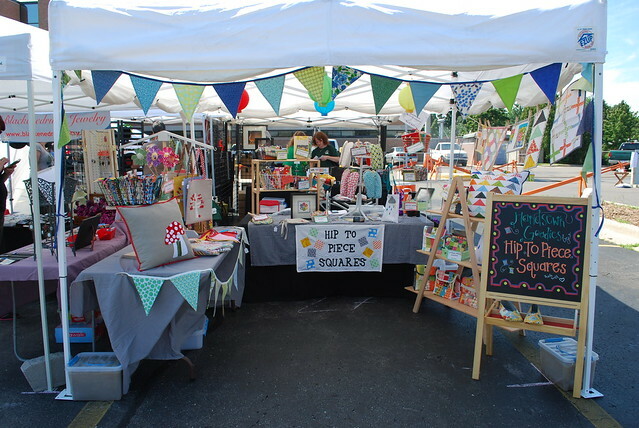 But please just remember, if you’re at a craft show or art festival this summer and you like what the craftspeople are making, tell them, or better yet, buy something from them. And if you don’t like what they do, it’s not your job to tell them! Wait until you get back in the car to talk smack about those crazy folks!